Pruning of elm trees is prohibited from April 1 to July 31 inclusive. a storage permit is obtained from the province. City of Winnipeg staff is currently conducting elm wood monitoring and Dutch elm disease surveillance on all properties in the City of Winnipeg. The co-operation of all citizens is appreciated. We are responsible for all aspects of modern 'urban forestry'. Includes tree inventories, tree planting, watering and fertilizing, pruning, D.E.D. control, removal operations, public relations and education, extension services, group workshops, on-site inspections and contract administration. The tree pruning program is rated on a priority basis, from high priority where the work will be carried out as soon as operationally possible to low priority where the work may not be carried out as quickly, click on the link above for an explanation. Significant increases in operating budgets have reduced the pruning cycle from 40 years to 12 years. The Urban Forestry Branch does not prune privately owned trees. Every year approximately 2,000 - 3,000 boulevard & park trees are lost. The reasons include vehicle impact, vandalism, snow plow damage, construction requirements, and normal tree mortality. For information about mushrooms growing around the removed tree stump click on the removals link. New subdivisions are planted under agreement between the City and private developers with the Urban Forestry Branch monitoring progress and accepting trees after all the obligations have been met. All newly planted trees receive water and fertilizer on a regular basis for 2 years after installation. New park plantings are completed as capital funds become available. For more detailed information about cankerworms and related defoliating insects in Winnipeg, please see: //www.winnipeg.ca/publicworks/insectcontrol/cankerworms/cankerinfo.stm or visit Trees Winnipeg. To avoid cankerworm problems in the spring, band your trees in the fall by September 15th or before the first frost. Bands remain on the tree over winter. In late winter or by March 15th, check your bands to see if more tanglefoot should be applied to protect the tree against the spring cankerworm. If the band is coated with moths and other debris, the spring cankerworm moth can crawl over the band. A fresh application of tanglefoot may be required. Take bands off by May 15th. A good rule of thumb is to band the trees on the September long weekend and take them off on the May long weekend. Bands that are left on the trees over our hot summers cause tree rot, encourage insect infestation and are unsightly. This devastating vascular wilt disease of elm trees was first identified in the Winnipeg area in 1975. To date, the integrated control program has limited the spread of the D.E.D. in the city while new research attempts to discover better methods of control. What is DED? 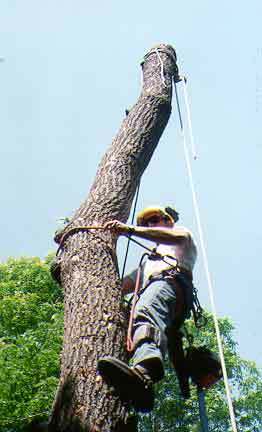 Stumps are removed to approximately 6 inches below grade and removal shall include buttress roots. Excess wood chips are removed so that a 4 inch layer of soil fills the remainder of the hole. Mushrooms growing on stump area - click on Stumping for more information. Each year a tree is picked to be moved and decorated in front of City Hall. If you think your tree would be a suitable candidate please check out this link. The Urban Forestry Branch responds to between 6,000 - 10,000 customer service calls each year. Urban Forestry Branch staff investigate these requests and prioritize them. If you have a boulevard or park tree concern then please call 311.